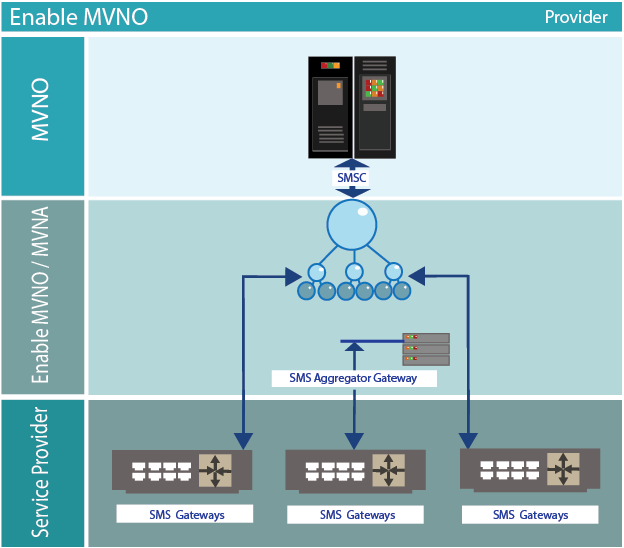 Diagram below, shows how MVNO works. Complete Service Provider workflow interface. From Registration to shortcode provision, the service provider can see the status/progress for each new shortcode provision request. The shortcode approval process is mapped to different status and at final approval the shortcode is provisioned on the main SMS aggregator gateway and MVNO back end SMSC. The provision will determine the right billing profile. Either MO or MT shortcode, the price-point should be set at this stage and the provision will be set up accordingly. When the shortcode goes live the end user premium messages will be charged accordingly. Monthly reports are available through the platform and will be provided to the Service Provider with a break down per shortcode. Revenue share is determined at this stage with the corresponding pay out. Support available for Service Providers messaging queries. Technical staff provides premium support to the service. MSC: Mobile Switching station for routing calls. HLR: Home Location Register is a database of all mobile users and their networks. GMSC: Gateway Mobile Switching Centre for connecting to all shortcodes in the market. Allows the the MVNO customers access shortcode driven services such as competitions, parking services, etc….